This song is That’s a Rockin’ Good Way sung by Dinah Washington and Brook Benton amd it made it to #7 on the Pop charts and #1 on the R&B charts in 1959. I heard this song on the radio yesterday and it made me think about Washington’s career and legacy. Known as both the Queen of the Jukeboxes and Queen of the Blues, Washington was one of the biggest recording stars of the 1950’s, singing jazz, blues and pop songs with her earthy delivery. 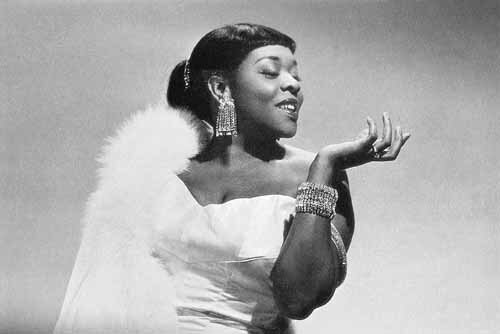 Her body of work is impressive yet she is seldom mentioned alongside the other jazz greats such as Ella Fitzgerald or Billie Holiday. In fact, she is little known today which is a shame not only because so many are missing out on her vast talent but because her story is such a compelling story. There are all the elements of great drama in her biography, her rise from a poor girl in Alabama to her great success as a major recording artist being only one aspect. There were all the men in her lives including 8 or 9 marriages, depending on which source you believe, and a number of other lovers. There was her battle with drugs and alcohol as well as a struggle with her weight which led to emotional swings that found her fighting with everyone around her, including her fans at times. There was the constant struggle with her record company for the respect she deserved. She had a big, big personality and finally seemed to be coming into her own as an artist when an accidental overdose brought her life to a close in 1963. She was only 39. There’s a nice concise bio online from jounalist Dean Robbins that I recommend.